If you’ve ever searched the internet for ‘best travel backpack’ or found yourself wandering around your local sporting or camping goods store, chances are you’ve come across the Osprey Farpoint series before. Being highly reviewed and widely available to try before you buy at stores is as good a reason as any to try this pack, but the Osprey Farpoint is so much more. After testing it for just over a year, we like to think we know it quite well! The Farpoint comes in four different sizes, a 40L, 55L, 70L and finally a whopping 80L! 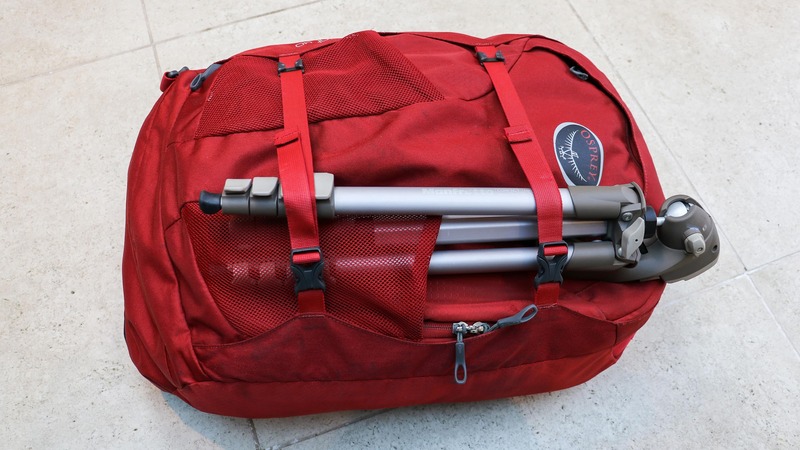 The bag we tested is the 40L (both the S/M and M/L models). It’s the only one that fits within carry-on specifications. Since we’re all about traveling as lightly as possible, this bag made the most sense. If you’re looking at the larger sizes, do stick around as most of what we’ll be covering will be applicable for them as well, but we recommend the carry on 40L size as we think it’s the slickest way to travel. So without further ado, let’s get into it! Now this bag looks like a travel backpack, which is fine because, well… that’s exactly what it is. It makes no attempt to look like a slick modern city pack, you either like this style or you don’t. It made it easier to throw around on the back of buses or lay in the dirt when need be. 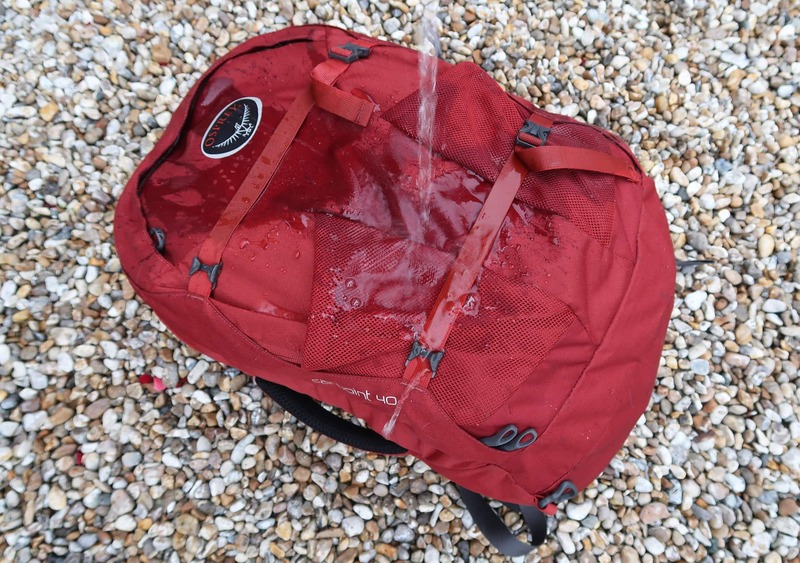 In our opinion, a travel backpack always looks best when it looks like it’s been through some stuff, every splash of mud and crinkle is a story to tell. The bag comes in three different colors (with the obligatory fancy names): a Volcanic Grey, Caribbean Blue and Jasper Red, or simply put, Grey, Light Blue and Red. There’s no difference with either color so whatever one takes your fancy. We went with Volcanic Grey and Jasper Red as darker colors are always a safe bet when it comes to backpacks, they’ll show less marks and dirt than their lighter colored counterparts. 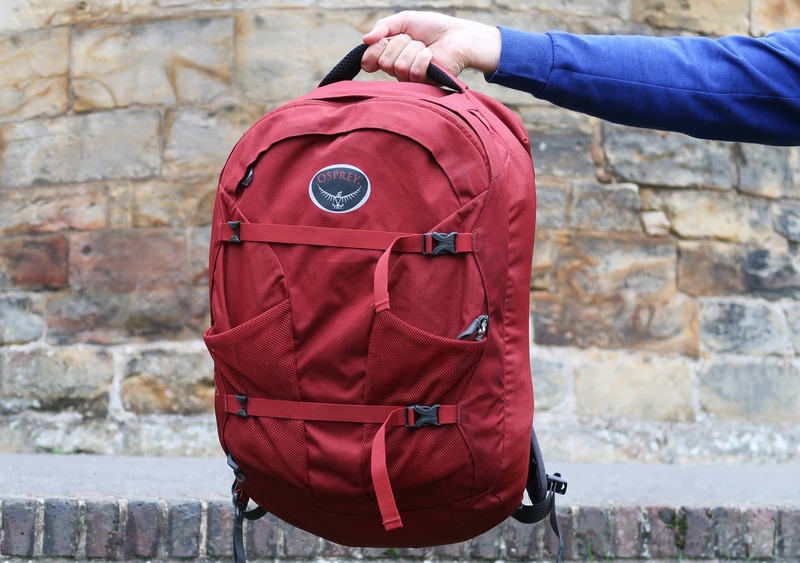 This pack comes in at 3.17lbs (1.44kg), which is incredibly light considering this is a 40L pack with multiple compartments, YKK zips and padded straps. 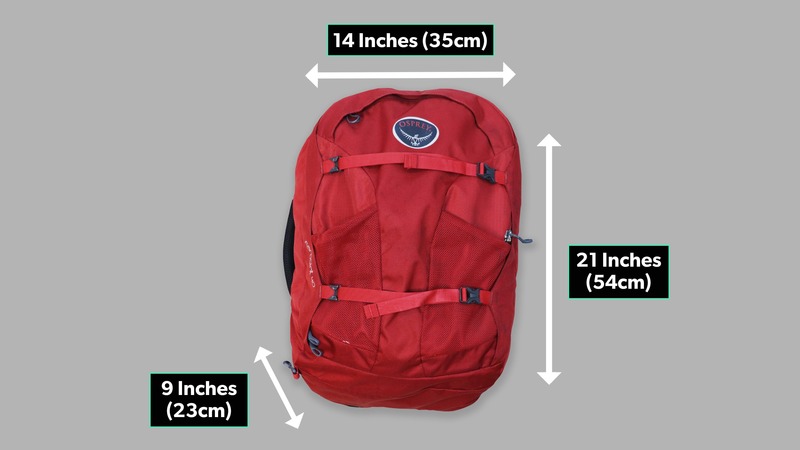 At maximum dimensions, this pack is 21” (54cm) in length, 14” (35cm) in width and 9” (23cm) in depth. The main material of this pack is ‘210D Nylon Mini Hex Diamond Ripstop’ and it’s one of the main reasons it’s so light. But don’t think just because it’s light this bag won’t be able to withstand much. The ripstop material makes it resistant to tearing and rips, but that doesn’t mean it’s impossible. 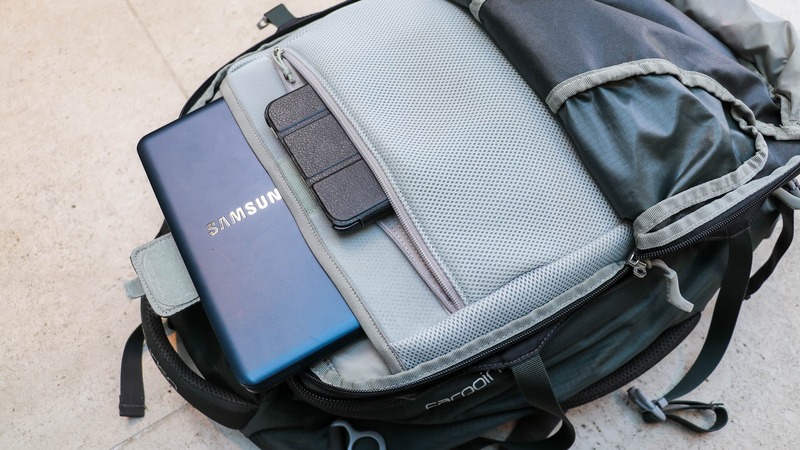 Though the M/L version of the bag has done incredibly well without any signs of wear and tear, the S/M version that we sometimes checked in on flights does have some small tears in the corner. We’re putting that down to how these bags are chucked around in an airplane. Luckily though, this is a carry-on sized bag so it’s not an issue for most. 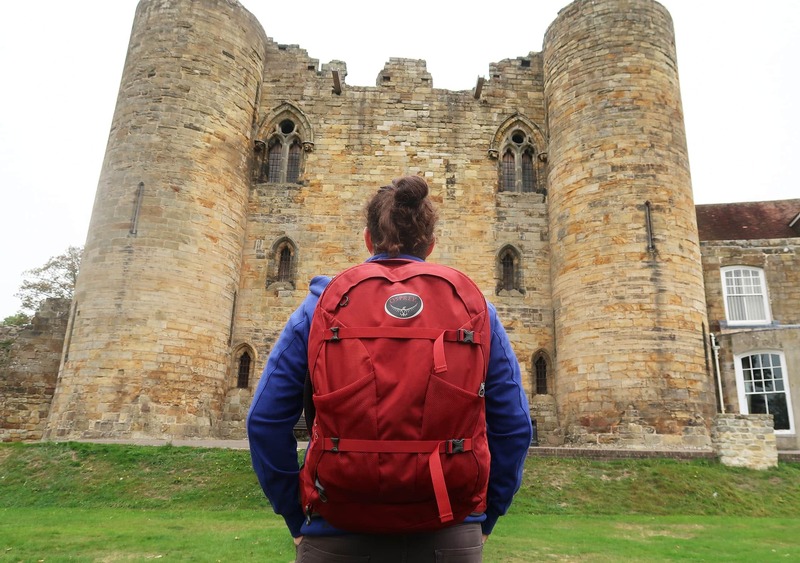 We also spoke to our friend Alex who said her bag held up very well as she traveled around Europe and Asia for 7.5 months. She did also mention some nicks and loose threads that appeared, though nothing that altered the integrity of the bag. This bag doesn’t claim to be waterproof but we’ve found it to be very water resistant. We’ve had it out in the rain with no signs of any water coming through. This is due to the 210D Nylon material which resists moisture really well. However, if you’ve got laptops or tablets in the front pocket, or just want a bit of peace of mind, you’re going to want to pick up a bag cover just in case. We only used ours once or twice in a year, but it was nice knowing if we got caught in a torrential down-pouring we’d be alright. At first glance, the Osprey Farpoint doesn’t look like it has too much fancy going on with its external components, but there’s some really nifty stuff going on here. Without a doubt one of our favorite things about this bag is that the harness, straps and hipbelt can all be zipped away at the back of the bag! If you’re wondering why this would be helpful or at all necessary, then let’s walk you through an everyday scenario of the standard traveler. 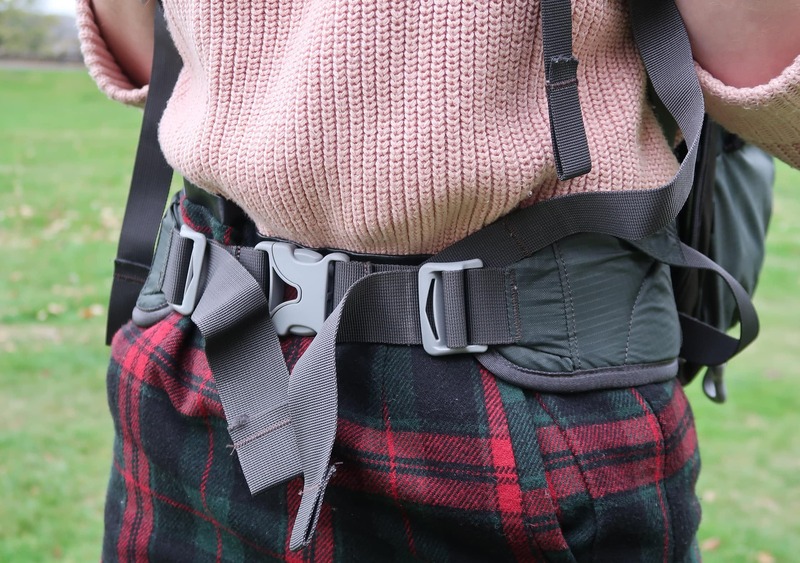 Let’s say you’re stowing your bag in the cabin of an aircraft, or underneath your seat on a long-haul bus journey, being able to tuck away those pesky straps that can dangle all over and get caught on whatever is a pretty cool thing right? It’s not reinventing the wheel, and you can live without it, but it’s a really handy tool to have at your disposal. After one year of pretty heavy usage we’ve had no issues with the zippers and trust them enough to be a bit rough with them when we have to get an overflowing pack shut, this comes as no surprise though as they are YKK, assuring quality and durability. The best thing about these zips though are that they’re lockable. 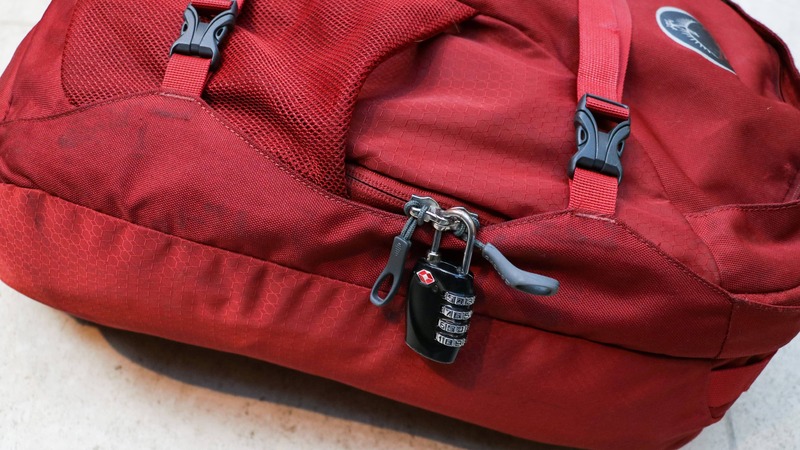 They join together and provide a clear hole to pop a padlock through—something that gives you great peace of mind when you’re chucking your bag at the back of a bus. Providing even more security are the straps that compress over the front of the pack. When these are locked in they actually pull the material over the zips, completely covering them. So not only are these zips locked, they’re not even visible! Other than compressing the bag and covering the zips, these straps also help with securing anything large you have in the dual mesh pockets at the front. For instance, they work great with a tripod that would fall out otherwise. Moving on to those mesh pockets at the front. They can come in super handy if you have a tripod. But when this bag is full, good luck trying to fit anything in them. A slim tripod leg works fine, but you’re going to struggle with a larger water bottle. This is only an issue when the bag is full to the brim, and we’d rather have them there than not at all. As with most travel backpacks, the Osprey Farpoint does have both top and side handles. Being a ‘backpack,’ this bag is supposed to go on your back and you shouldn’t be carrying it for any length of time using these handles. But when you’re grabbing your bag from an overhead cabin locker or you’re in a rush and have to grab your bag quick, these handles can be clutch. The handles are really comfortable to hold and are nicely padded. Regardless, when this bag is at full capacity it shouldn’t be anywhere but your back. The shoulder straps on this pack are comfortable and well padded. Plus you have the added sternum strap and hipbelt for added load-lifting comfort. The hipbelt is nicely padded and doesn’t flail around when not locked. And the sternum strap doesn’t dig in, all solid wins in this department. One last thing to add in this section is that the bag does come with an attachable single shoulder strap… if you want to wear this bag like a briefcase? We took ours off straight away and never had any need to attach it, that’s pretty much all you need to know. The main compartment is a large clamshell design, giving you quick access to everything inside. 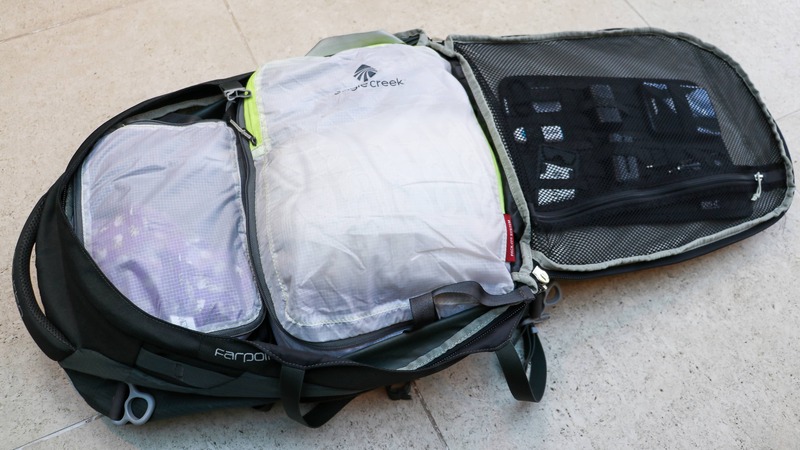 Osprey sums it up well on their website by saying, “Carried like a backpack but packed like a suitcase.” Now being a clamshell, you don’t necessarily need packing cubes like you would with a toploader. However, we’d highly recommend picking some up for the added organization, if you don’t have any already—check out our reviews on packing cubes and organizers. Within the main compartment, you also have straps to compress everything when it’s fully packed. These come in surprisingly handy and are a nice addition, but you don’t need to use them by any means and can leave them at the bottom of the bag. Finally, inside this main compartment there’s a large mesh pocket that covers the whole front side. Whilst not good for anything bulky, it’s great for flatter items and works nicely with a Cocoon Grid-It. The second, smaller compartment at the front of the bag looks like it has loads of room when this bag is empty. However, when the main compartment at the back is full, there’s really nothing going in there. The space is just too compressed. This is a shame because when buying the bag you’d think “oh great, I can cram a load of stuff into that front compartment as well,” but sadly you’ll be disappointed. You can get away with cramming some more flexible things like socks and maybe a jumper at the bottom and still get these zips shut, but it’s not ideal. Now where this front compartment comes into its own is with the two sleeve pockets: one for a laptop and one they call a ‘tablet sleeve.’ We found this to be great for notepads, journals and slimmer books. They do call these sleeves ‘padded’ on their website, and they are, but are in no way heavy duty. So don’t go throwing this bag down on its front… but that would be a weird thing to do anyway. A major downside of this pack is the fact that the laptop sleeve is located at the front of the bag, meaning the weight isn’t close to your body and therefore the distribution isn’t ideal. If your laptop is too heavy, you could find yourself rocking backwards. Now this issue is a bit of a catch 22, because if the laptop compartment was at the back of this pack you’d have to unload the whole thing to get to it. Alternatively, some bags have a separate laptop compartment behind the main compartment. This is usually great and we love them, but we also love the function of being able to hide our straps away. It’s hard to include both of these features cleanly in a pack. So in a weird way, even though the placement of the laptop sleeve isn’t ideal, we think Osprey may have just about got this one right. This bag isn’t all large compartments though, oh no. There is one very small zipped pocket at the top, front of the bag. Now this pocket isn’t going to do anything special, and we never found ourselves using it for anything too specific, but it’s great for quickly chucking smaller items in, like your phone and wallet when you’re going through airport security. It’s important to note also that when this bag is all zipped up and the straps at the front are locked in, it’s not the quickest bag to get into, making this smaller front pocket a necessity for quick grab items. At the time of writing this review, we’ve been using the Osprey Farpoint for just over a year. It’s been through the mountains of Eastern Nepal, on the back of electric scooters in Northern Myanmar and on the beaches of Southern Cambodia — and we’ve trusted it the entire time. At no point have we ever had any problems with the bag, or wished we’d had anything else. Now if that’s not a good travel backpack we don’t know what is. As mentioned earlier on in this review, we had both the S/M and M/L versions of the bag. We found the cutoff to be around 5”8, so go with the S/M if you’re under and the M/L if you’re over. One thing that’s very important to note though is that sneakily, even though it’s still called the Farpoint 40, the S/M version only has a capacity of 38L. If you’re under 5”8 you may be tempted to get those extra 2 liters and go with the M/L version, we’d highly recommend you don’t though, your back will thank you. 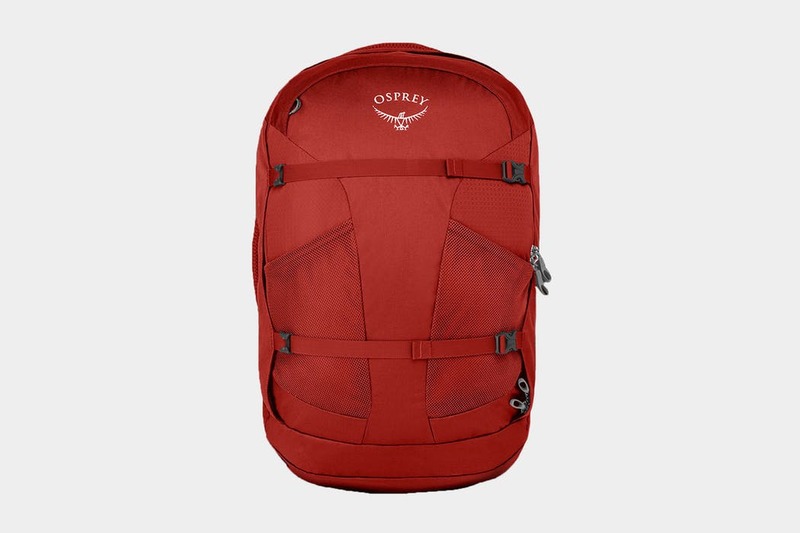 Even though we’ve only had a couple of tiny rips in one of the bags, Osprey does offer what they call an ‘All Mighty Guarantee.’ It sounds great at first read, “Should you find any defect in the way your pack has been built we will repair or replace it without any charge, within its reasonable lifetime.” Now the phrase ‘reasonable lifetime’ is where you may come into an issue. Osprey has cleared up this phrase in one of their responses to a review by saying, “What this means is that a pack that gets used every day such as the Quasar (similar to the Farpoint) is going to wear quicker than a pack that is only used once a year. Each of our guarantee cases is looked at individually so that the utilization of the pack can be evaluated to see that the pack has had its reasonable lifetime. 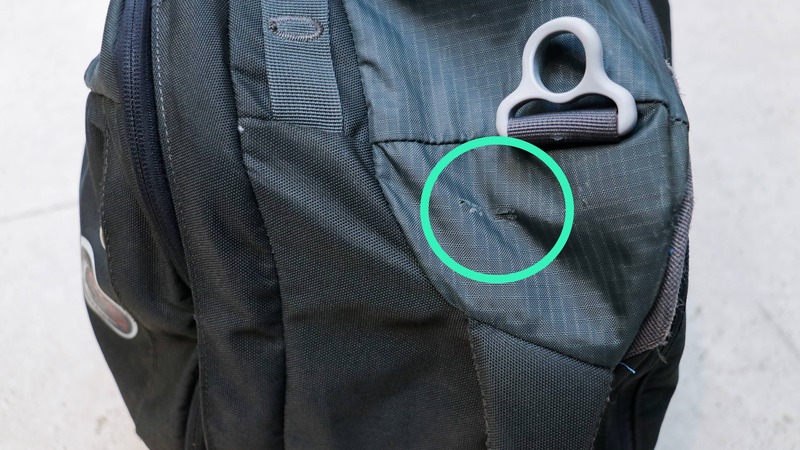 Hence wear and tear is not covered by our guarantee, as well as malicious and accidental damage.” Now we’re still not clear on just how long they consider the ‘reasonable lifetime’ to be on the Farpoint Osprey, but it may not be as long as you think. With that being said, after traveling to more than 17 countries using various airlines, we have yet to have any major problems arise. It has continued to fit just right under airplane seats and we think it’ll continue to get the job done! Great to use straight away, doesn’t need to be worked in. When you get the straps just right, this bag is incredibly comfortable, even at full capacity. Looking good as new. Feel more comfortable throwing this bag around now, still no signs of wear. Some small rips in the corner of the S/M version of the bag have appeared, we put this down to having checked this bag into the hold of a few flights. 16 countries and counting. All buckles and zips still work as if new. 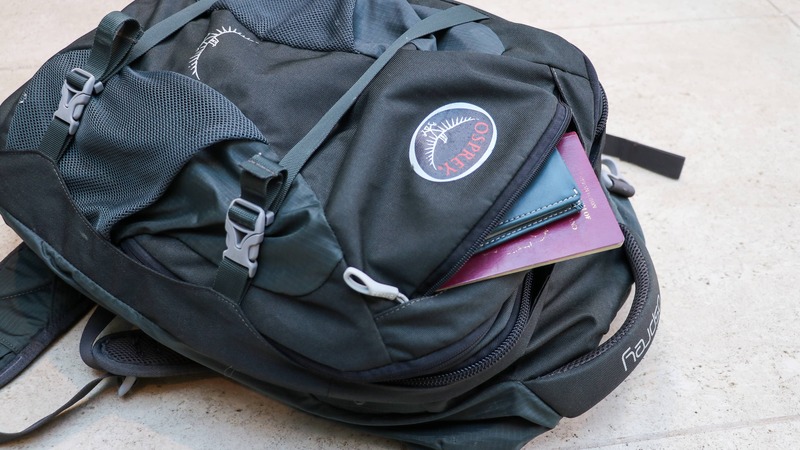 The Osprey Farpoint is a travel backpack, and that’s exactly what it does best. 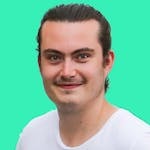 Perfect for the digital nomad that moves onto a new country every week or month. We can attest to its reliability. It’s become a bag we can trust, even after a year of heavy use. It’s highly reviewed on the web because simply put, it’s a great bag, one you can travel the world with.